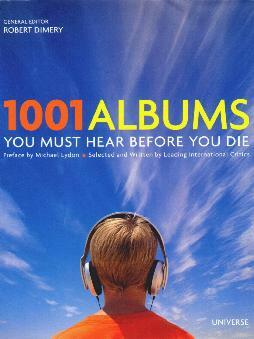 Can one listen to 1,001 albums? That's a lot of music! Most of us have our ultimate favorite music albums, some for personal reasons, some universal classics, and some just great music. This very heavy book lists a cross section of musical styles so you're likely to be reminded of an album, or song from your past. However, if you don't recall the 80s, 70s, or 60s, your list will probably still be going through a growth spurt. You're in luck though, as there are some fantastic oldies you can listen to, no matter the genre and no matter your age. Can you imagine your iPod bursting at the seams with songs from these albums? This is a great reference book for any and all music enthusiasts. There are selections from the decades, beginning with the 50s. A track listing of the albums is also provided, as well as some background information to the artist/s and the albums. I recall many, many albums featured here, and I would love to get my hands on some of them, especially as I couldn't bring all with me when I came to America. Conclusion - Fun, informative, and very interesting.